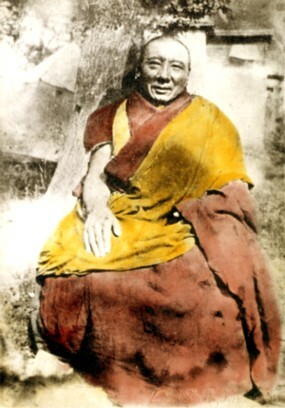 Khenpo Shenga (Tib. མཁན་པོ་གཞན་དགའ་, Wyl. mkhan po gzhan dga’) aka Shenpen Chökyi Nangwa (གཞན་ཕན་ཆོས་ཀྱི་སྣང་བ་, Wyl. gzhan phan chos kyi snang ba) (1871-1927) — an important figure in the Rimé movement who revitalized study in much of Eastern Tibet by founding shedras and by revising the scholastic curriculum with an emphasis on the classical treatises of India. The great Khenpo Shenga Rinpoche, or Shenpen Chökyi Nangwa, was born into a family by the name of Gyakong, in a place called Drok Ruma. His youth was spent in ordinary worldly activity, until one day, he was suddenly struck by the futility of samsara and overcome by boundless regret at how he had wasted his precious life up until then. It is said that he left home staightaway, without taking any of his possessions, and went off in search of the great Patrul Rinpoche. From Patrul Rinpoche, he gained a letter of introduction to Önpo Tenzin Norbu, who was to become his root master. Tenzin Norbu was the nephew of the great Gyalsé Shenphen Thayé and through his wisdom mind he could see that Shenga was the incarnation of his famous uncle. Despite his advanced age, Shenga had never learned to read, and so he had to begin by learning the alphabet. All the younger monks used to mock him and call him names like ‘the grown up kid,’ but he persevered with unwavering determination and unimaginable diligence. In those early days he was so poor that he was forced to scavenge for food among the leftovers from his lama’s residence. He also suffered from a nervous condition which made it difficult for him to walk, yet still he exerted himself and persevered enormously in his studies. On one occasion, as he struggled to carry water and was obviously suffering greatly, his guru Tenzin Norbu saw him and was moved to tears. “Here is a student who really has the right karma,” he thought, and considered offering Shenga some kind of financial support or additional assistance. But then as he considered it further, he realized that it would not be right for him to interfere and prevent such accumulation of merit. Instead, he pretended not to notice and said nothing. After Shenga had been studying for a few months, Tenzin Norbu granted him an authorizing transmission (jé nang) for the practice of White Sarasvati and suggested he undertake a retreat. Shenga did the practice in retreat for just two weeks before he experienced the signs of accomplishment, including visions of the deity, and gained extraordinary powers of recollection and self-confidence. From that point on, he mastered all the instructions of his guru and became unbeatable in debate. From that time onward, all the students in the encampment treated Shenga with the same respect as they did their guru. Tenzin Norbu gradually entrusted him with all the teachings of the lineage, which he himself had received from Patrul Rinpoche and from his uncle, Gyalsé Shenphen Thayé. This included all the teachings on the basic sciences such as grammar, medicine and astrology, as well as all the major texts of sutra and mantra, and the ultimate pith instructions of Dzogpachenpo. When Shenga took full monastic ordination he received the name Shenphen Chökyi Nangwa, which was seen as a confirmation of his being the incarnation of Gyalsé Shenphen Thayé. Upon completion of his studies, Shenga received Tenzin Norbu’s own personal copies of many of the commentaries on the sutras and tantras, and especially the so-called ‘thirteen classical texts.’ The guru said to him, “If you base your teachings on these texts, the students who uphold your lineage will be like stars in the night sky, and the precious teachings of the Buddha will shine like the sun.” True to this prophecy, Khenpo Shenga’s famous annotated commentaries (chendrel) on the thirteen classical scriptures went on to form the core of the curriculum in many of the shedras throughout Tibet, especially in the Kham region, and his many learned students carried his tradition throughout the whole of the Land of Snows. Shenga’s powers of recollection were such that whenever anyone asked him a question he was able to recall precisely any passage from the teachings, almost as if the texts were right there before his eyes. In particular, he became known for his mastery of the Seven Treasures of Longchen Rabjam. When Tenzin Norbu passed away, Shenga stayed on and taught at the Gemang hermitage. Then, some time around 1902, he was invited by the Fifth Dzogchen Rinpoche Thubten Chökyi Dorje to teach at the great Shri Singha Shedra at Dzogchen Monastery. Although he was hardly known when he first arrived, before long students were flocking to his teachings from all the branch monasteries and hermitages connected to Dzogchen monastery and from further afield, as his reputation for learning spread throughout the whole of Kham. But to rest in total peace, beyond concepts." Khenpo Shenga continued to receive teachings throughout this time, from the fifth Dzogchen Rinpoche and from other masters such as Khenpo Pema Vajra. He also studied with the great Jamyang Loter Wangpo at Lasi Gang hermitage, and received from him teachings on the sutras and commentaries and also the Lamdré instructions of the Sakya tradition. 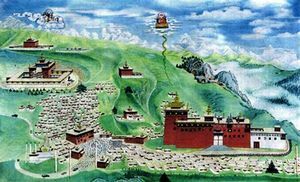 From Dzogchen he went to Palpung Monastery at the behest of his student and patron Tai Situ Wangchok Gyalpo, in order to establish a shedra there. It was during his time at Palpung that he composed many of the annotated commentaries for which he is now so renowned. After about seven years, he was invited by Jamyang Khyentse Chökyi Lodrö to become the first khenpo of the newly built Dzongsar Kham-je Shedra. He inaugurated the shedra in 1918 and then taught there during its first two years. His students at the time included Khenpo Jamyang Gyaltsen, also known as Khenpo Jamga, who had also studied with him in Dzogchen Gemang hermitage and later at Dzogchen monastery, and who later gathered together the writings of the great scholar Gorampa Sonam Senge and became an important teacher of the Sakya tradition. After his time at Dzongsar, Khenpo Shenga founded another shedra at the Sakya monastery of Kyegön Döndrub Ling. He frequently undertook retreats focused on various yidam deities and gained signs of accomplishment. He was blessed with a vision of the omniscient Longchenpa and afterwards wrote a praise of his qualities. When he passed away on the fifth day of the first Tibetan month of the Fire Hare year (1927) at a place called Gyawa Phuk, he was only fifty-six, which, if we consider how late he began his studies, makes his achievements all the more remarkable. "[In Tibet] there have appeared highly accomplished saints who were no different from the vidyadharas of India, the Land of the Aryas. Yet although there have been countless eminent scholars, none of them might be compared with the Six Ornaments and Two Supreme Ones of India in terms of wisdom and enlightened activity. […Some] Tibetan scholars took as their basis the excellent Indian treatises but then added explanations based on their own clever ideas, with the result that on occasions their statements no longer accord with scripture or valid reasoning. In particular, the works of Nagarjuna and his successors have been fervently debated among Tibetans, with the assertions of earlier Tibetan scholars subjected to a great deal of presumptuous refutation and affirmation by later scholars." He was widely recognized as an incarnation of Gyalsé Shenphen Thayé although he was not the official Gemang Tulku. Jamyang Khyentse Chökyi Lodrö and the great Sakya master Jamgön Ngawang Lekpa had clear indications that he was also an emanation of Sakya Pandita, and many of his students saw him as none other than glorious Chandrakirti. To many however he became known simply as Shenga Dorje Chang, Buddha Vajradhara in person. His many illustrious disciples included Jamyang Khyentse Chökyi Lodrö, Tai Situ Pema Wangchok Gyalpo of Palpung, Dilgo Khyentse Rinpoche, Serkha Chökyi Drakpa and Rahor Chökyi Drakpa, who were known as the ‘Two Chödraks’, Khenpo Ngawang Palzang (also known as Khenpo Ngakchung), Öntö Khyenrab Chökyi Özer (the second khenpo of Dzongsar shedra and also Khenpo Shenga’s successor at Palpung shedra), Khenpo Jamyang Gyaltsen (the third khenpo of Dzongsar shedra), Dezhung Tulku Ajam Rinpoche (1885-1952), Dezhung Chöphel (the fourth khenpo of Dzongsar shedra), Dezhung Rinpoche, Bo Gangkar Tulku, Washul Khenpo Tsewang Rigdzin of Mewa, Sönam Gönpo (1895-1967), Norbu Tenzin, Khangmarwa Rinchen Dorje, Jikmé Dorjé, Dosi Thubten, Khenchen Surmang Pema Namgyal, Kardzé Buram Nawa Lobzang Tenzin, Alak Gurong Choktrul, Bathur Khenpo Thubten Chöphel, Drayab Lodrö Zangpo, Rinchen Dorje, Geshe Tsultrim Palzang, Geshe Namgyal Palzang, Khunu Lama Tenzin Gyaltsen (the famous teacher of His Holiness the Dalai Lama), Geshé Tenpa Rinchen of Bhutan, Geshé Rinchen Dorjé and Geshé Padma Tsering. At Dzogchen Monastery his principal students were Khenpo Lhagyal (aka Abu Lhagong), Khenpo Thupten Nyendrak, Khenpo Jikmé Lodrö, Könchok Zangpo, Khenpo Chimé Yeshé, Khenpo Yönten Gönpo (aka Khenpo Gönri, 1899-1959), Pema Chöphel, Kyamo Chökho, Yabchen Ngawang Norbu (father of the sixth Dzogchen Rinpoche) and Khenchen Pema Tsewang (1902-1959). Dilgo Khyentse Rinpoche, Brilliant Moon, Shambhala, 2008, pages 31-38. Jackson, David. Saint in Seattle: The Life of the Tibetan Mystic Dezhung Rinpoche (Boston: Wisdom Publications, 2003), pages 25-33. Nyoshul Khenpo, A Marvelous Garland of Rare Gems: Biographies of Masters of Awareness in the Dzogchen Lineage, Padma Publications, 2005, pages 492-499. This page was last edited on 4 July 2017, at 21:26.